PT Coca-Cola Amatil Indonesia - CCAI or known as "Coca-Cola Amatil Indonesia" is a major player in beverages industry in Indonesia. CCAI is the producer and distributor of the Coca-Cola products for all over Indonesia, except for the North Sulawesi Region which is served by PT Bangun Wenang Beverages Company. CCAI is a local member of Coca-Cola Amatil Limited (ASX : CCA), one of the world largest manufactures and distributors of Coca-Cola products from Australia. Coca-Cola products has strong reputation in Indonesia for more than 87 years. Coca-Cola brands was first introduce in 1927. Later in 1932, Coca-Cola's products was locally produces in Indonesia. PT Coca-Cola Amatil Indonesia officially established in 1992. 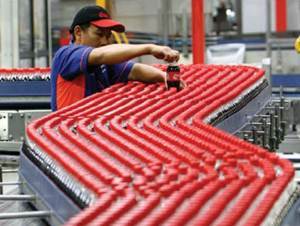 According to CCAI's factbook as cited by JobsCDC.com, PT Coca-Cola Amatil Indonesia now has 9 bootling plants located spread across Indonesia; Medan, Padang, Lampung, Cikedokan, Bekasi, Bandung, Semarang, Surabaya, and Denpasar. CCAI also supported by 3 Regional Distribution Centres (RDC), located in Medan North Sumatera, Cibitung Bekasi West Java and Semarang Central Java. Sales - General Trade : all major. Supply Chain (Manufacturing) : Electrical and Mechanical Engineering. Business Services (Cold Drink Equipment Service, and Logistics) : Management, International Business, Industrial Engineering, Electrical Engineering and Mechanical Engineering. IT : IT, Computer Science, Instrumental Engineering. Background in Bachelor or Master Degree (S1/S2) with minimum GPA 3.00 within 4.00 scales. Fresh graduate or have a 1-year work experience. Willing to be placed in any city in Indonesia. Own and able to ride a motorcycle. JobsCDC.com now available on android device. Download now on Google Play here. Please be aware of recruitment fraud. The entire stage of this selection process is free of charge. PT Coca-Cola Amatil Indonesia - Graduate Trainee Program CCAI April 2017 will never ask for fees or upfront payments for any purposes during the recruitment process such as transportation and accommodation.